You might have thought that the expression “dog days” referred to the times when it was so hot that even the dogs would hang around listless and bored, doing little more than panting and yawning. But originally, the phrase didn’t actually have anything to do with sweet doggies or their reaction to the heat. 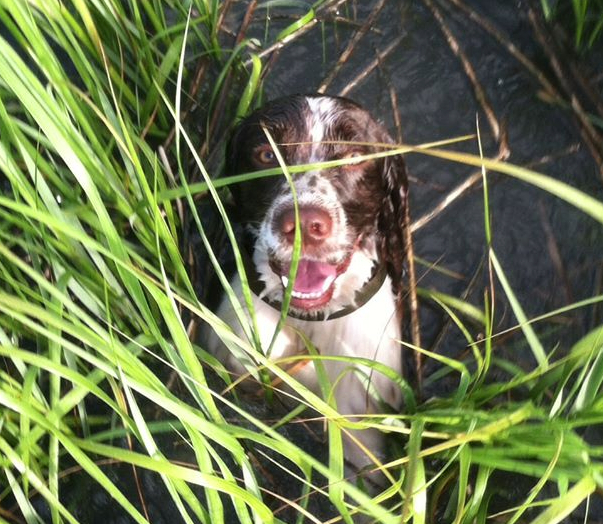 So why do we call this time of the year the dog days of summer? Dog Star... Are you Sirius? To the ancient Greeks and Romans, the dog days refer to the position of Orion’s dog star, Sirius, in the sky: the rise of Sirius just before the sun marked the timing of the dog days. But because this happens in July, it corresponds with the hottest part of the year--which could bring on fever or catastrophe. Even the Iliad refers to Sirius as Orion’s dog star, and it’s rising associated with war and disaster. Of course, where you are on the planet and in time will determine whether the dog days will correspond with the hottest days of the year. It’s true that in North American, July and August tend to be the hottest months of the year--but this can vary. And depending on your latitude, the astronomical dog days can come at different times, which may or may not correspond with the hottest time of the year. Another reason the astronomical dog days may not mean heat: the stars shift as the Earth wobbles in its rotation, completely independent of our calendars. 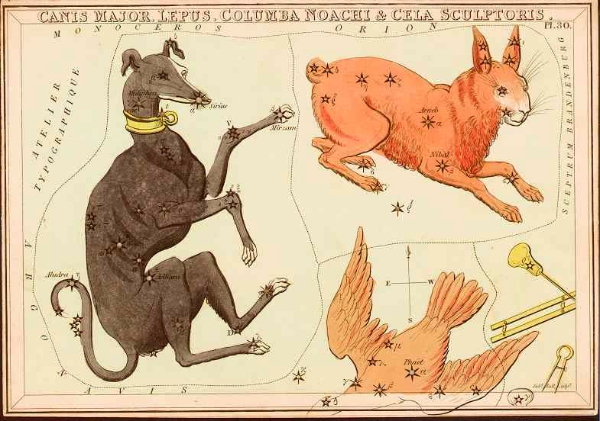 So while the Roman’s dog days tend to correspond with astrology’s sign of Leo (July 23-August 23) and the Old Farmer’s Almanac refers to the dog days as the 40 days between July 3 and August 11, in several millenia the dog days may fall in the middle of winter. Future dog days will call for a Sirius fire in the fireplace, perhaps? Keep Your Cool, dog-gone it! Today’s Charleston dog days call for taking it to the beach, or the river, or the pool--wherever you need to be to wash off the heat. With different leash laws on our local beaches, we thought it’d be a good time to review where to go if you’ve got your pooch in tow. Isle of Palms: Of all of our local beaches, Isle of Palms is the only one that allows dogs on the beach during summer days. Goose is welcome on the beach at any time all year long here--as long as she’s on a leash at certain times. Off-leash hours for fetch and a swim are in the morning (5-9 am) during the summer (April 1st-September 14th) and extended to include afternoons and evenings during the winter (4 pm-10 am). Residents of the island (but not visitors) are asked to register their dogs. Kimber’s Aussie with his friend Ava out at Edingsville Beach off Edisto. Photo by Cat Lambert. Sullivan’s Island: It’s a little more complicated to get your dog on the beach at Sullivan’s Island. All dogs--residents, vacationers, day-visitors--must wear an up-to-date, Town-issued $35 permit to be on the Island at all. During the summer (May 1st-Sept 30th), dogs aren’t allowed on the beach from 10 am to 6 pm but are welcome for an evening stroll (on-leash from 6 pm-5 am) or a morning game of fetch (off-leash from 5-10am). During the winter, leashes are required after noon. Think twice about taking your pup to the beach before your application is approved, since as memory serves, the fines are pretty steep! Folly Beach: While Folly is indeed laid waaay back, to protect your pooch, no dogs are allowed on the beach during hot summer days (May 1st-Sept 30th, from 10 am-6 pm). 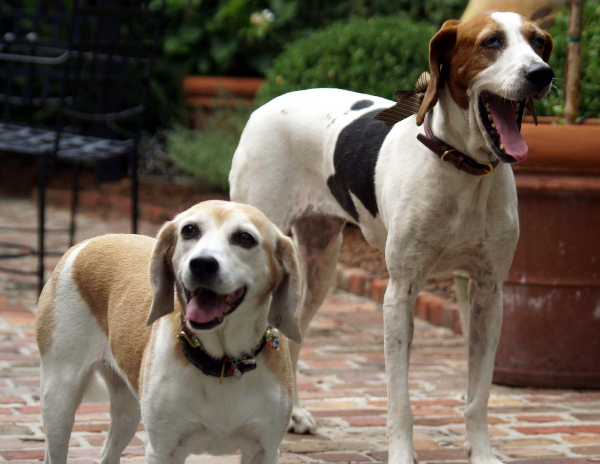 There is a full-time leash law currently in effect, with a $500 fine for breaking it. Those rules may be officially changing in the future so you won’t have to sweat it if your dog wants to play on a date. Tubbs takes a dip wherever he can and John’s (mostly) okay with that. Charleston has at least a dozen parks where you can take your dog off-leash, and a couple offer beaches. 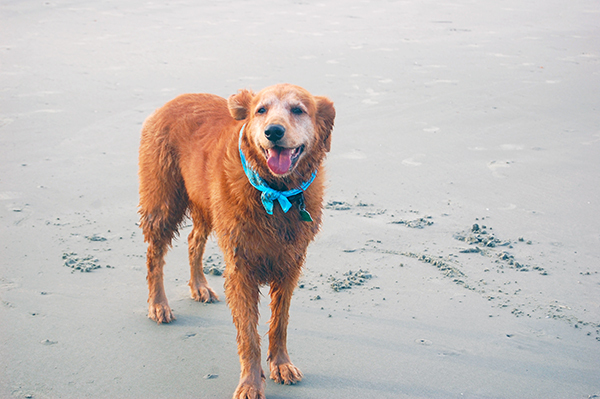 Beachwalker Park out at Kiawah allows dogs, but they should be leashed at all times. 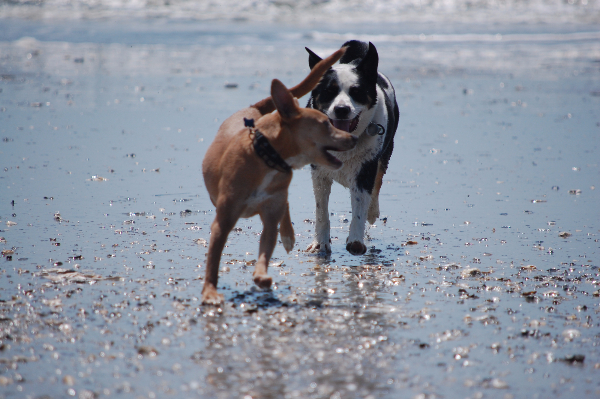 James Island County Park has one of the best dog parks around--including a beach and four acres of open grass. There are great facilities out there, and you’re sure to meet some fun friends--especially if you go to the monthly Yappy Hour at the park. The next one is on September 17th, from 4 pm to sunset, with music by Dallas Baker and Friends. Bay Street Biergarten also does a Yappy Hour--there’s one next Tuesday--with part of the proceeds going to the Charleston Animal Society. Also--check out Dog Day Afternoon at Whirlin' Waters Adventure Waterpark on September 13th, where Otter Bay, the Wave Pool, and the Lazy River will only be open for dogs. Like the dog days of summer, every dog’s days on Earth are numbered. 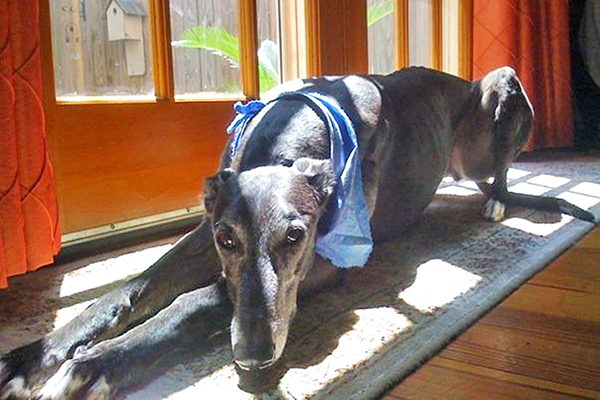 This week our thoughts are with Ellery as she mourns the loss of her greyhound Olivia, who is now ‘sleeping on the moon’. We know that they will meet again someday and cross the Rainbow Bridge together.